Nancy started playing flute when she was ten years old after playing piano for four years. In high school she was a member of many music groups including the Kansas City Youth Symphony, Charlotte Youth Symphony and the Charlotte Symphony. Nancy soloed with the youth symphony playing Chaminade's Concertino. While in Charlotte, she also played in the orchestra pit for the summer theater musicals, the circus when it came to town and other gigs where a flutist was needed. 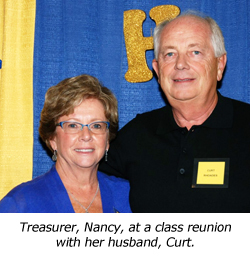 Nancy was a charter member of the Charlotte Flute Club in 1964. She also played in the Irving, Texas, Community Orchestra. After a 35-year hiatus from flute playing, Nancy joined The Little London Winds and The Pikes Peak Flute Choir. She is also a member of Cinnamon Tea flute ensemble and the Tri-Lakes Music Association. Nancy is a retired court reporter and loves spending time with her four grandchildren. To make a donation to The Little London Winds, visit our donation page for more information!